A peanut butter and jelly sandwich is as straightforward as it gets when it comes to "cooking." Two pieces of bread come together with two sticky spreads in sweet harmony. While this quintessential American sandwich has its merits, it can be made that much better when it is fried. A Monte Cristo is essentially a sandwich that has been dipped in custard and fried in butter (like French toast). 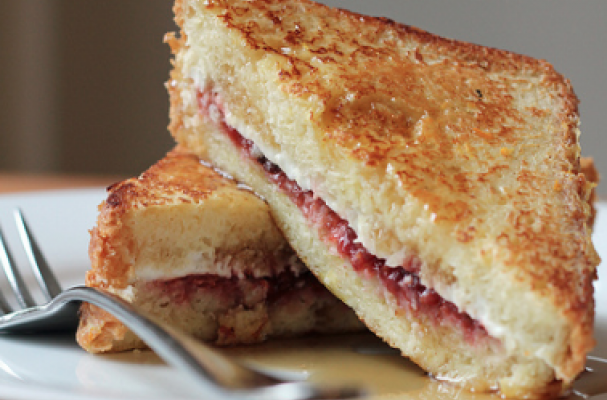 Once you've experienced the delights of a PB&J Monte Cristo, there is no going back. The filling becomes warm and gooey while the toasted bread provides a crisp contrast. This recipe can be easily multiplied so you can feed just yourself or a crowd. Step 1: Assemble the peanut butter and jelly sandwiches. Lay out two slices of bread. Spread peanut butter on one slice and jelly on the other slice then combine the two pieces. Step 2: In a shallow dish, whisk together the egg, milk and vanilla extract until all ingredients are combined. Set aside. Step 3: Melt the butter in a large nonstick frying pan over medium-low heat until foaming. Dip the whole sandwich in the reserved egg mixture, flipping to coat both sides. Place the sandwich in the pan and fry for 2 to 3 minutes until golden brown and crisp. Repeat on the other side. Step 4: Transfer the sandwich to a serving platter and garnish with a dusting of powdered sugar.